* $300 of cookies & assorted candies. There are over 750 lights in and on the 5 houses. Each house took about 25 – 35 hours to complete. The total combined weight of the houses is over 500 #. 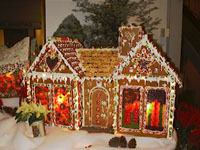 The Gingerbread Houses were baked, constructed & decorated in about a two month period. It took the entire Culinary & Stewarding Staff’s participation along with some willing Bartenders, Wait Staff, and many volunteer hours from Family & Friends to complete the houses. Visit here for more.